When you are in the business of delivering virtualization solutions to customers, it helps if you know what you are talking about. While that is pretty obvious in and of itself, there is a great deal of work required to stay on top of the technology and trends. In most cases, you need a lab to work in. Having a sandbox in which you can try out new technology becomes a critical piece to the training and educational process. More importantly, if you are studying for any advanced certifications, access to a lab is pretty much a requirement for success. This was where I did most of my studying and practice while preparing for my VCAP-DCA and VCAP-DCD exams. I am fortunate enough to have two different labs in which to play. First is my Demo Lab at the Mosaic Technology office. I was granted an isolated port off our firewall directly to my lab, and a private VPN into that network. On that network I have a Dell M1000 blade chassis with two M610 blades, two R710 and one 2950 racked servers, several Dell switches and two EqualLogic iSCSI SANs. This affords me enough hardware to configure just about any possible environment or scenario physically. However, the nature of my job keeps me away from the office most of the time, with only 2-3 days per month onsite. I can still VPN into my lab and make changes as needed, test new solutions or offerings, and even integrate new hardware and products into the rack. But as we added features and products, it became less of a sandbox and more of a showcase. There wasn’t enough flexibility in the environment for me to extend my knowledge as needed. As a result, I decided to take matters into my own hands. When it came time for me to get a new laptop, I leveraged our position as a Dell partner to select a Precision 6500 mobile workstation for my new PC. Large 17 inch display, dual i7 processors, and 4 memory slots gave me great flexibility. Additionally, there is room for a second internal hard drive. I purchased with 4 GB ram and a 250 GB SATA drive standard. I installed another 8 GB RAM to bring it up to 12 GB, and added a Seagate MomentusXT hybrid drive in the second slot. Installation of VMware Workstation 7 gave me the horsepower I needed to build out a lab internally. 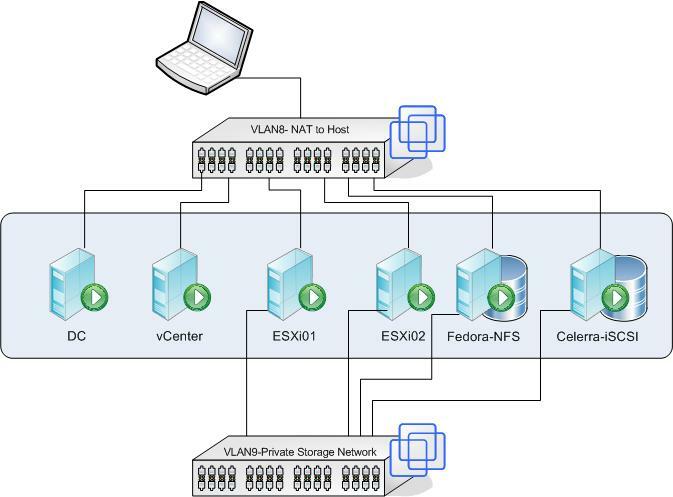 To begin with, I configured the virtual networks to use two vlans, the first VLAN8 was set for NAT to the host as a LAN connection. VLAN9 was configured to be host-only for storage network. I copied over a basic Win2k3 and Win2k8R2 image, creating two VMs from the base images. On the Win2k3 server I installed Active Directory and DNS. The Win2k8R2 became my vCenter server. I then created two VMs, 5 GB in size, and installed ESXi 4.1 on each. Once configured, I joined them to vCenter. As shared storage, I chose NFS. From the Virtual Appliance Marketplace, I downloaded a Fedora VM, added a 100 GB second drive, configured it to export the second disk via NFS, and then mounted it to the ESXi hosts. I also downloaded the Celerra Simulator from EMC to act as an iSCSI target as well. With this in place, I now have a vCenter lab that I can take along with me wherever I go. Since the Public network is NAT to the host, I have a virtual NIC on my laptop on VLAN8. Once the VMs are powered up, I can use the tools on my laptop to interface with the lab. I can SSH to the hosts or the NFS server, use my vSphere Client, or RDP into the vCenter server or DC as needed. This is a great little lab configuration that I carry with me all the time. If I need to troubleshoot a problem, or try out a new tool or application, I can install it into my laptop lab easily. While I won’t win any awards for performance, as everything is a VM running on a single hard drive, at least I can bring it up anywhere. On several occasions, I have fired it up onsite with a customer to try out a new configuration or demonstrate a concept. Nothing beats a live demo! Anyhow, I hope that this inspires some of you to give it a try. Do you need to buy a couple of servers to build out a home lab? Not if you don’t want to. In most cases, a good laptop or a desktop will suffice. This entry was posted in certification, VCAP-DCA, VCAP-DCD, VCDX, VCP, virtualization, vmware and tagged certification, exam, hybrid, vcap-dca, vcap-dcd, vcdx, vmware. Bookmark the permalink.